Wield the mighty Aeon Weapons against the demon hordes in our most ambitious real-time MMORPG yet! Go on a stellar journey and fight alongside your Hero to strike out the dark forces that sprung from the planet’s core! Summon epic heroes and build mighty towers to eliminate Loki's army of darkness. Summon your legion of allies and take CCG combat to the next level in this riveting multiplayer experience. Ready, set, draw! 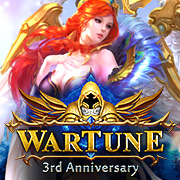 A revolutionary combination of multiple game genres, Wartune is one of the most exciting browser based MMORPGs to date! Unleash the wrath of Angels in the epic battle against evil. Build your team while taking on engaging mini-games and intense PvP combat! Recruit, train, and unleash a formidable party of mercenaries and charge against the shadows in this new MMORPG! Uncover a dark conspiracy that could shatter the realms of mankind. Take your place among champions, and fight for justice! Become a shapeshifting hero from the Chinese epic Journey to the West and discover an MMORPG unlike any other! Heed the call of Zeus and lead a team of heroes into battle in this legendary MMORPG. Lift the curse and save Mount Olympus! Launch into a world of adventure. Befriend and train dragons to help defeat the invading demon horde in this exciting MMORPG! An insidious evil is on the rise. Master powerful forgotten arts in this dynamic action adventure with a retro flare. Blast your way through hordes of ravenous zombies and their alien overlords… think fast or you'll end up a topping for sure! The gates of hell have opened and a true hero must arise to seal them shut. Stop the foul hordes of evil in this epic RPG! Ride into battle with a Goddess, uncover court intrigue, become a master of martial arts, and unify China in this epic MMORPG. Only the one who masters the Kung Fu techniques hidden in the Heaven Sword and Dragon Sabre shall prevail. Show off your custom outfits. Claim glory in wildly fun PvP. The best of MMOs and classic 2D platformers. Make friends, join in epic PvP battles, and become a hero in the world of Eternal Saga, an exciting new MMORPG. A refined browser MMORPG. A vast world, captivating story, and thousands of other players. Explore the land of Vidalia! Don’t waste a single second! The quest is always ongoing in this mobile idle RPG on iOS and Android. Seize the throne! Defend, Invade, and Dominate your foes in the mobile tower-building strategy game of the year! Direct powerful armies into battle! Experience this thrilling strategy card game on iOS and Android.